Participants of the discussion. Credit: Meri Bekeshova / UNDP. 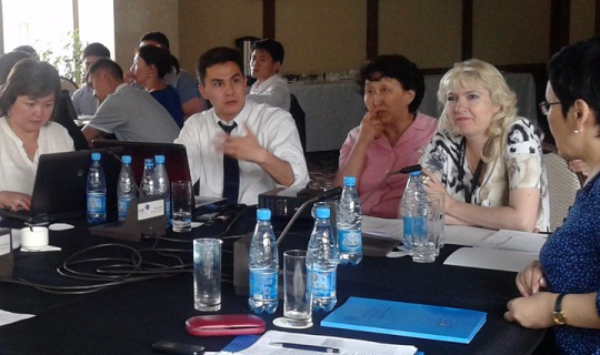 Bishkek, Kyrgyzstan – UNDP organized discussions to finalize the work plan of the new project “Widening Access to Justice” with participation of representatives of civil society, government and international organizations. The overall objective of the project is to promote legal empowerment of disadvantaged groups and vulnerable people in the Kyrgyz Republic with a focus on women in rural areas, children and youth at risk, persons with disabilities and improvement of their access to justice and legal aid in compliance with international human rights standards and recommendations.The project will be implemented in Chui and Osh oblasts, Bishkek and Osh cities during four years. “We are committed to support development of the draft law on free legal aid that will enable effective and quality assistance to citizens in both criminal and civil cases. All this work will require adequate contributions of lawyers’ associations, universities and civil society” said Lucio Valerio Sarandrea, UNDP’s Chief Technical Adviser on Rule of Law. Inadequate level of access to free legal aid and representation. “In order to ensure access to justice for vulnerable groups is required close cooperation between government authorities and civil society representing these groups” noted Ainura Bekkoenova during the meeting. Other participants expressed their vision and suggestions on widening access to justice for project’s target groups. Participants agreed that the general awareness of rights is low, and there are even bigger issues related to disabled people. One of the articipants, head of association of the blinds and deaf-mute Kalyk Mambetakunov suggested to include blind and deaf-mute people in the target group of the project. There are more than 9 thousand blind and deaf-mute people in the country. “After the collapse of the Soviet Union, none of the government schools prepared sign language interpreters. There were cases when disabled people were sent to jail because of the very reason that they could not explain their thoughts. The deaf-mute have the right to drive. When they get in a car accident, in most cases they become guilty because they cannot prove their innocence,”- he said. UNDP expert on information technology Chynara Suyunbaeva proposed to develop an information portal, which will be adapted for people with disabilities to integrate into the information space. The project “Widening access to justice in the Kyrgyz Republic” is supported by the Ministry for Foreign Affairs of Finland and UNDP.